Kraythow would I go about editing the background for the mode selection/map selection menus? [quote=Krayt]how would I go about editing the background for the mode selection/map selection menus? Whisker Kraythow would I go about editing the background for the mode selection/map selection menus? [quote=Whisker][quote=Krayt]how would I go about editing the background for the mode selection/map selection menus? You should be able to do a research for "Toggle Minmode" (do it case-insensitive) in the common menu files and find the element, it's not a standard one. Krayt Whisker Kraythow would I go about editing the background for the mode selection/map selection menus? [quote=Krayt][quote=Whisker][quote=Krayt]how would I go about editing the background for the mode selection/map selection menus? how do i edit the green health pickup number above my health? zeFrostyhow do i edit the green health pickup number above my health? [quote=zeFrosty]how do i edit the green health pickup number above my health? q1 : how can i make the buttons sharp ? q2 : why bleed and mad milk icons and the others aren't visible , i tried to change the position and tried to change "visible" and "enabled" values but it didn't work :( ? q3 : phlog meter isn't visible , any solutions ? How do I edit the loading screen menu and the bar on the bottom right corner and remove the stats panel? solly6How do I edit the loading screen menu and the bar on the bottom right corner and remove the stats panel? i think you can edit the loading screen through editing statsummary file , you can find it in "your_hud_name\resource\ui"
[quote=solly6]How do I edit the loading screen menu and the bar on the bottom right corner and remove the stats panel? [url=https://imgur.com/uM9SEik]Screenshot[/url][/quote] i think you can edit the loading screen through editing statsummary file , you can find it in "your_hud_name\resource\ui"
3. See 2 for finding hud elements with the vgui_drawtree. 2- ty that helped :D but it didn't make the icons show up..
and... are you the creator of whitelist.tf ? How can I keep my chat at the top of my screen? After matches in a valve server finish, it moves my chat back down and I have to hud_reloadscheme to get it back to the normal position at the top left of my screen. 2SP00KY5M82- ty that helped :D but it didn't make the icons show up.. Try again with the default hud file and apply your font/position changes to the main elements (text/cross) and see if they appear then. Alex_fHow can I keep my chat at the top of my screen? 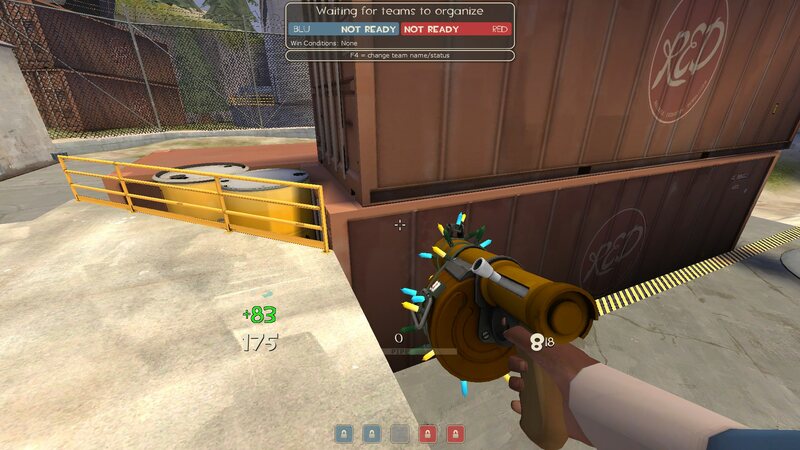 After matches in a valve server finish, it moves my chat back down and I have to hud_reloadscheme to get it back to the normal position at the top left of my screen. Either modify the Lower/Restore events to have the same ypos values or comment out/remove the events in MoveChatWindow. how can i edit team status display? i want move it to down but i can't fine what res file is it. How do I fix team mate health bars in a hud? Specifically in ma3las hud you can only see half a cross above the team mates head so if you are playing medic you can barley tell what health they are. 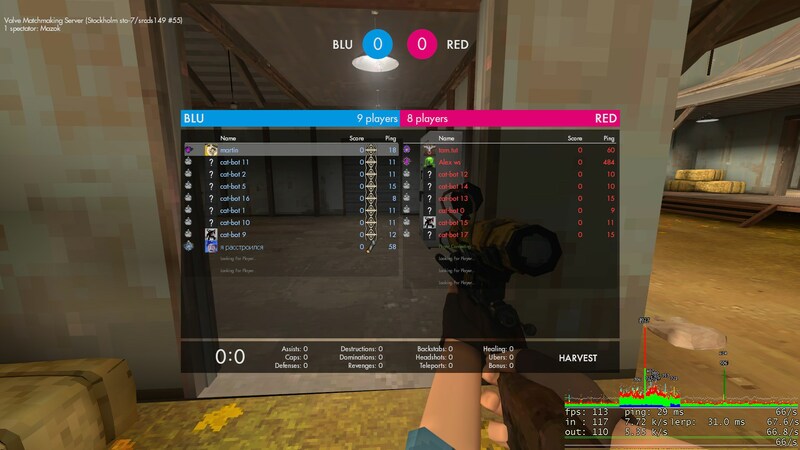 The summary scoreboard in casual is initially broken - all elements are bunched up in the same x position, but after the first time the scoreboard appears, it works fine. Is it a problem of the default HUD, or there's a fix? phoxhow can i edit team status display? i want move it to down but i can't fine what res file is it. martinhrt phoxhow can i edit team status display? i want move it to down but i can't fine what res file is it. I would like to have my health and ammo take up the same amount of my screen when swapping between 1280x720, 1920x1080, and 2560x1440. Could someone please direct me to what I should be changing to scale the font size? If this means I'd need to have 3 versions of the hud then that is fine. I have tried adding additional font sizes in ClientScheme.res, and setting HudPlayerHealth.res & HudAmmoWeapons.res to the new values but to no avail. I don't really know what I'm doing. Are wide & tall values within the /resource/ui/ files relevant if the font itself isn't changing size/there is no issue with clipping? I'm trying to use the hud achievement tracker method for a crosshair (this one) . It works once I set the achievement to be tracked in-game except once I restart the game the achievement isn't being tracked any more. how do I keep it tracked between sessions? martinhrtThe summary scoreboard in casual is initially broken - all elements are bunched up in the same x position, but after the first time the scoreboard appears, it works fine. Is it a problem of the default HUD, or there's a fix? Also what hud is the in game scoreboard from? I'm trying to use the hud achievement tracker method for a crosshair [url=http://rebelconquer.net/4134/how-to-use-multiple-hud-crosshairs](this one)[/url] . It works once I set the achievement to be tracked in-game except once I restart the game the achievement isn't being tracked any more. how do I keep it tracked between sessions? [spoiler][quote=martinhrt]The summary scoreboard in casual is initially broken - all elements are bunched up in the same x position, but after the first time the scoreboard appears, it works fine. Is it a problem of the default HUD, or there's a fix? phox martinhrt phoxhow can i edit team status display? i want move it to down but i can't fine what res file is it. WackyfireballI'm trying to use the hud achievement tracker method for a crosshair (this one) . It works once I set the achievement to be tracked in-game except once I restart the game the achievement isn't being tracked any more. how do I keep it tracked between sessions? [quote=Wackyfireball]I'm trying to use the hud achievement tracker method for a crosshair [url=http://rebelconquer.net/4134/how-to-use-multiple-hud-crosshairs](this one)[/url] . It works once I set the achievement to be tracked in-game except once I restart the game the achievement isn't being tracked any more. how do I keep it tracked between sessions? 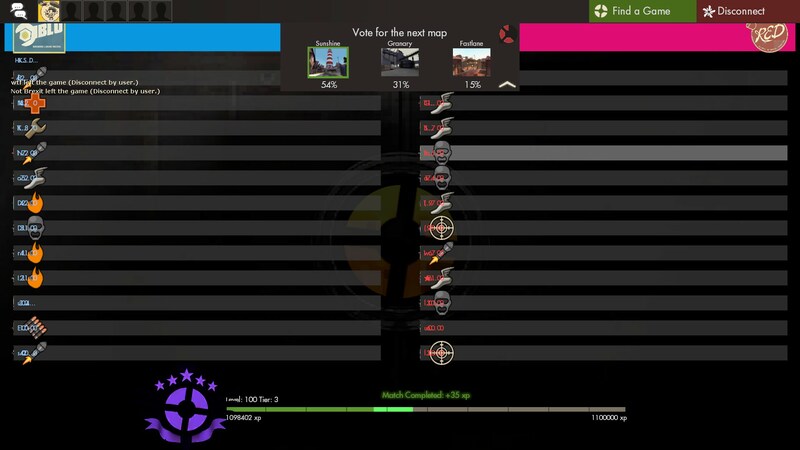 Hey, I'm keen to edit the match hud panel (the stuff at the top added in the recent update). I want to remove all the backgrounds from these hud elements, and if possible change the class portraits to class emblems (maybe change the way the health bars work as well). Is there any easy way of doing this? martinhrt phox martinhrt phoxhow can i edit team status display? i want move it to down but i can't fine what res file is it. first picture is team status display on, second is off. then how can i using second when i team status display on? if it's impossible, how can i turn off bg colors in first pic? Make sure to have vgui_cache_res_files 0 if you want to see changes made to your hud files reflected ingame with a hud_reloadscheme. Welcome to Valve/TF2, they are checking for the HudItemEffectMeter_Action file, which doesn't exist (doesn't anywhere), which is why it's throwing this error. You can create your own _Action.res file if you want to get rid of the error, but when valve does add it your custom file will negate the newly added file. Make sure to have [i]vgui_cache_res_files 0[/i] if you want to see changes made to your hud files reflected ingame with a hud_reloadscheme. How can I edit the stats section? Mine is all black.